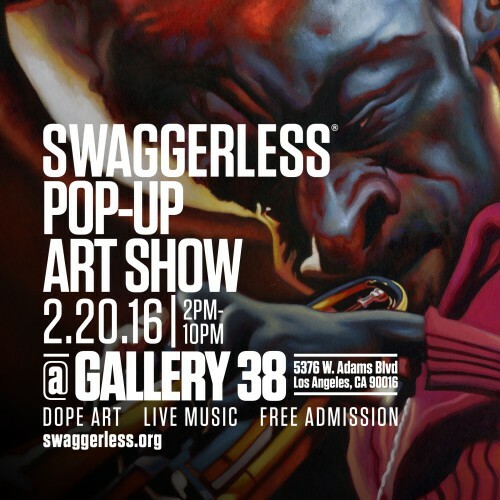 Swaggerless’ one day pop-up will take place Saturday, February 20th 2016. Public hours are from 2pm-10pm. ​O​ v e r a d o z e n u n d e r g r o u n d a n d e m e r g i n g a r t i s t s from around the world will showcase their hottest work under one roof at the Swaggerless Pop-up Art Show offering buyers, collectors, and guests an eclectic mix of styles and mediums, from fine illustrations, paintings, and photography, to digital art, mixed-media, printmaking, and more. Notable artists include tapestry designer, Keith Collins, who has created custom works for Michael Jackson, LeBron James, Enzo Ferrari, and Floyd Mayweather, Jr. among others, and Brooklyn creative, Christian Jackson, who has written and directed videos for A$AP Rocky, Dos Equis, and more. The pop-up will also include live music and DJ performances. A​rtists include Buenos Aires analogue and digital collage artist, Ignacio Rivas; Barcelona-based fine art illustrators and designers, David Pugliese and J​ésica Cichero; San Francisco mixed media abstract artist and painter, Seren Moran; Sarajevo, Bosnia and Herzegovina​collage artist, Knut van Brijs; Brooklyn based writer, director, photographer, and illustrator, Christian Jackson; Los Angeles based optical illusion painter, Vakseen; Philadelphia based artist and designer, Billy Abstract; Los Angeles based designer tapestry artist, Keith Collins; and more.